This center is dedicated to wellness, health care and functional rehabilitation. From January 2009 the center has removed to a new location of 1500 square meters and has opened an area for hydrotherapy purposes. 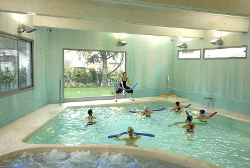 The center uses thermal spring water of Terme Felsinee. The hydrotherapy area is composed of a hydrotherapy pool (32°C) where a wide range of courses like water aerobics, water fitness and acquawellness are offered, and of a chronotherapeutic pool (36-38°C) known for inducing relaxation and relieve muscle aches and spasms. There is also a jet spa that, alternating hot and cold water, improves blood circulation of whole body, as well as a vascular path for legs and feet. The sauna thermotherapy (dry sauna of 85/95°C) improves blood circulation and detoxifies the body.